Apple of Eris for windows 7 by ZeusOSX is currently the best Mac Snow Leopard look theme for Windows 7. Apple of Eris Themes are mac osx style themes for windows 7.
new progressbars are remade and many many others. IN ancient and in nowdays Hellenic (=Greek) [Active CODE] language, every letter, and every word is a specific number, and it has a specific meaning. Apple of Eris is a reference to the Golden Apple of Discord (Greek: ????? ??? ??????) which, according to Greek mythology, the goddess Eris (Gr. ??? ?, “Strife”) said that she would give “to the fairest” at the wedding of Peleus and Thetis, sparking a vanity-fueled dispute between Hera, Athena and Aphrodite.. Thus, “apple of discord” became a euphemism for the core, kernel, or crux of an argument, or for a small matter that could lead to a bigger dispute. The Ancient Greek word “???? ?” also means sheep or goat.. Homer in his Odyssey describes how Odysseus sacrificed two goats (????) when he reaches the underworld. So the name of the THEME choosen from Hellenic = GREEK language and civilization. This is a Work from Hellas = Greece. Is dedicated to All people of Earth who support : the Hellenic = Greek History, Philoshophy, Civilization and the Greek people. These visual styles have made to be worked with my system files i have made and exist in my Macos X for Windows 7. The navigation buttons exist to explorerframe.dll, the apple start orb to explorer.exe and the icons to imageres.dll and to shell32.dll. also when we select a folder as ‘icon’,we have separate mouse over image for the folder and other image for the text and when we select a folder as ‘details’ we can have stripes, and mouse over images like mac os X , blue hover and white text, with additional code i have made and add to system files. first go to Control pane [view by category] –>so Go to Control PanelUser Accounts and Family SafetyUser Accounts and press the folder ‘Change User Account Control Settings’ set the slider to the next window Never Notify. restart. do all your changes in code that u want. 1. To use the visual styles ( mstyle) , you must install a small application, download from [Here] . Credits goes to Rafael Rivera for this amazing work. Then restart your system. 2. Copy the folder ‘OS X Cursors’ , to C:WindowsCursors . Copy the ‘Mac os X Wallpapers’ of this pack to C:WindowsWebWallpaper. Copy the ‘Mac os X sounds’ of this pack to C:WindowsMedia . 3. 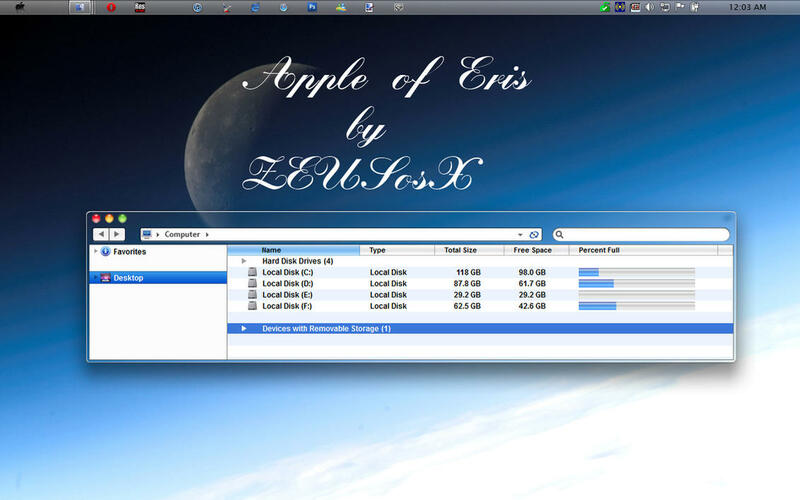 Copy all the folders included in the folder ‘APPLE OF ERIS THEMES BY ZEUSosX’ [after unzip all files, and copy them to C:WindowsResourcesThemes , provided C is your Windows drive). These new visual styles/themes have biger TASKBAR, 24 pixels height , so it works fine when we log in, though its 2 pixel bigger than original osx. Also the shape of taskbar has changed in a mode that also taskbar can be used as a dock to the down side of the desktop. Open there [“C:WindowsResourcesThemes”] and choose the theme name you like, select it, double clik tand thats it. 4. Go to Desktop Personalize & apply the theme you preffer. Then drag with your mouse any of the folders exist to yoyr taskbar for ‘PIN’ each you choose. There are some folders having shape of separator so you can divide your taskbar to sections. right clik to taskbar/properties/customize/Turn system icons on or off —> set clock off , also set any other you want to off position. -2. For having close the min,max,close buttons an Ave’s application needed CloseButtonChanger needed, (login to [Here] ) , transparent and brushed styles will use number : 1.3 , leopard styles will use number : 1.4 .
right clik to desktop/personalization/sounds select it , a small window appear, there is a small button and the text near by says : Play Window Start up Sound , deselect the button, thats it, restart. MAKING SOME APPLICATION WHICH DOES NOT START WITH THE START OF WINDOWS, ENABLE TO START. then go again go to control panel/clasic view/folder options then go to view and deselect show hidden files and folders. 1. do not change border padings. 2. do not change font size (leave it 96 dpi font size). these kind EXPOSE style programs are giving the sense of osx using style, you can see all windows you have added to your desktop at once and with a clik to choose any window of them as the active one ! if you use the smaller size taskbar at the top of the desktop then you can make the looking of the right side of windows 7 taskbar as possible as mac os x right side of taskbar, without changing any system files. also if you use the smaller size taskbar at the top of the desktop then you can use alternatively docks like RK Launcher [Link] or [Link] or use RocketDock [Link] or any alternative you like. This Visual Style/Theme, is Copyright protected By : ZEUSosX (Pavlos Pitselas). This Article Has Been Shared 7604 Times! An excellent premium quality theme for Microsoft Windows 7. Windows 7 Theme Luto who loves the semi transparent royal black glass effect on their desktop and Windows 7 PC. Very nicely crafted by the developer. Cite this article as: Abhishek Ghosh, "Best Mac Snow Leopard look theme for Windows 7 : Apple of Eris," in The Customize Windows, December 25, 2010, April 18, 2019, https://thecustomizewindows.com/2010/12/best-mac-snow-leopard-look-theme-for-windows-7-apple-of-eris/.